We’re very lucky to live relatively close to a great organic dairy. While I often get our milk delivered as part of our grocery order, every so often we go directly to the dairy and stock up on a few essentials. The real benefit of going directly to them is, the more milk you buy at one time, the cheaper the price per bottle, so we try to make sure we’ve got lots of room in our fridge on a dairy day. In addition to several bottles of 2% milk that I buy for use in my tea and cooking (we tend to use soy milk on our cereal), I usually grab a bottle of whole milk for yogurt, half & half for hubby’s coffee, and whipping cream for baking and making butter. The ridiculously huge block of cheese is a bit of an investment (about $40 a pop), but it often lasts us for months, and ends up costing much less than if we were to buy individual blocks of organic cheese. I love that their milk continues to be packaged in glass bottles. Not only does it reduce the amount of garbage that would otherwise go into the landfill, but we don’t have to worry about the chemicals that are reported to leach out of standard plastic containers. It’s always a treat to visit this quaint piece of farming history in the middle of the city. ← Happy Birthday “P” Pup!! 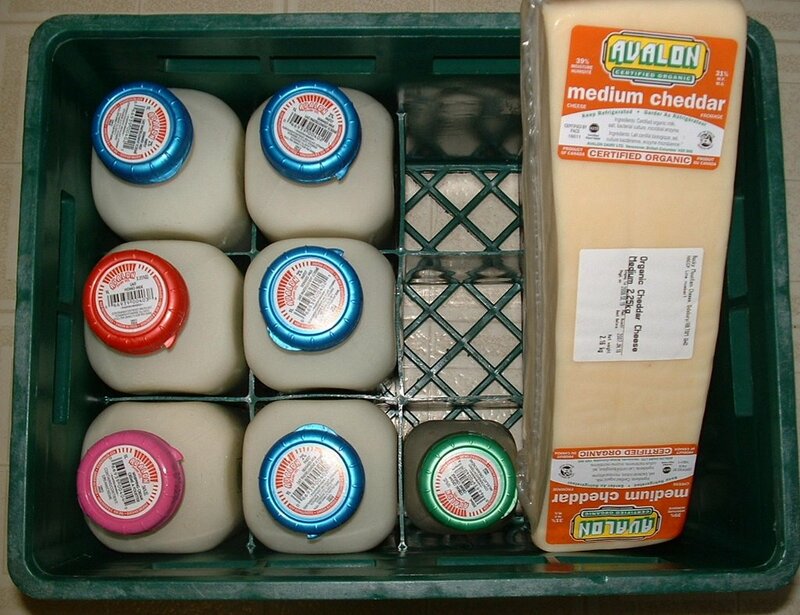 We’re also lucky to have an organic dairy that uses returnable glass bottles nearby-It really is the best. Question: When you make yogurt, do you use a starter from a packet or a bit of yogurt from a perevious batch or store? We tried using yogurt as a starter and sometimes it worked and other times it was very runny. I just wondered what you recommend. Burdockboy – I usually use a bit of yogurt from the previous batch when I make it, but I’ve used both. It may be that the yogurt you’ve used wasn’t fresh enough or didn’t have active cultures in it. Also, if the milk is too hot when you add the yogurt, it will kill the bacteria. Thanks. We kept a thermometer in the milk so I think that was okay, but perhaps the yogurt was old. I used Nancy’s yogurt which varies a lot anyhow. I think I’ll try the packaged cultures this time. Yum…and just when I was trying to cut back on dairy. Think I will make yogurt this week too. I used to make it all the time, but it’s been awhile.